Guarani-Kaiowás (Portuguese pronunciation: [ɡwaɾaˈni kaj.uˈwa]) are an indigenous people of Paraguay, the Brazilian state of Mato Grosso do Sul and northeastern Argentina. In Brazil, they inhabit Ñande Ru Marangatu, an area of tropical rainforest. This was declared a reservation in October 2004. 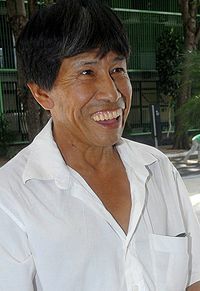 Marcos Verón, a leader of this people was beaten to death in January 2003. They are one of the three Guaraní sub-groups (the others are Ñandeva and Mbya). They mainly live in the Brazilian state of Mato Grosso do Sul. It is estimated that more than 30,000 Guaranis live in Brazil. In Paraguay they number about 40,000. The Guaraní language is one of the official languages of Paraguay, alongside the Spanish language. The Guarani-Kaiowá are also known as the Kaiwá, Caingua, Caiua, Caiwa, Cayua, Kaiova, and Kayova. These spellings were largely devised by Europeans, The National Museum of Brazil (Portuguese: Museu Nacional) keeps records of the earliest Latinized forms for transcribing the name on behalf of the people, coincidentally Kaiowá means exactly this 'the people' - in their own language. They speak the Kaiwá language, a Tupi-Guarani language, Subgroup I. Literacy is extremely low—from 5% to 10%. Kaiwá is written in the Latin script. The Guaraní sub-groups have different ways of social organisation, but they share a religion which sees the land as very important. The god Ñande Ru created the Guarani as the first peoples and the Guarani are deeply spiritual, as there's a prayer house in every village and the cacique, shaman, is of great importance in the community. "Terra sem Mal", which means land without evil is the land of the dead people in their mythology, and it is important that every soul can go to Terra sem Mal. When invaders occupied Guarani land, the Guarani feel as if their religion is offended, and when they lose their land to intruders they have too little land to sustain their traditional life, based on fishing, hunting, and farming. Many live in abject poverty in camp sites at the side of busy motorways or in temporary settlements in occupied farmland in the state of Mato Grosso do Sul, in Central-West Region, Brazil. They consider this land as their ancestral land. Their lifestyles consist on living happily on their own land, growing small crops to support their livelihood. These villages have schools and Government assistance. Despite the tribe still fights for living in this territory according to their traditions, young generations are starting to getting in contact with new technologies thanks to the work of some NGO’s such as Our Tribe. These NGOs offer workshops to teach young tribe members techniques to document their lifestyles. The Guarani-Kaiowá had no contact with the European settlers before the late 1800s. Since the beginning of the 1980s, the Guarani-Kaiowá tribe has been gradually forced to leave their traditional settlements as a consequence of the deforestation to get soy, corn and cane plantations. This eviction process has worsened the Guarani-Kaiowá living conditions. Furthermore, the non-secured and underpaid work on plantations has provoked deaths, even of young children, during decades. The attacks this community has received have their root on the high profitability of the lands they inhabit for the growing of agri-businesses and biofuel industry. For example, the Guarani tribe has denounced for years the permanent threat of expulsion from their lands and the poisoning by farmers of their water resources. “ We are already going to and want to be killed and buried along with our ancestors here where we are today, therefore, we ask the Government and the Federal Justice not to decree our eviction, but instead we request them to decree our mass death and to bury us all here. We ask them, once and for all, to decree our total decimation and extinction, besides sending many tractors to dig a large hole to drop and bury our bodies. This is our request to the federal judges. We already await this decision of the Federal Justice. Decree our mass death Guarani and Kaiowá of Pyelito Kus/Mbarakay and bury us here. Given that we fully decided it and won't leave this place dead or alive. The federal order detailed that in case the indigenous community does not abandon the land, the Fundação Nacional do Índio (Funai) will have to pay 250 dollars per day they still occupy the territory. Parts of the Brazilian press understood the letter as a mass suicide announcement. The Avaaz.org issued a petition against their genocide. The decision was suspended by a court order on October 30, 2012. In 2012 the Indian museum in Rio de Janeiro, around which exists a Guarani-Kaiowá settlement, also received an eviction order. This settlement is next to Maracana football stadium, which in requirements of the FIFA, has to be expanded for the inauguration and closure ceremonies of the Football World Cup. In October 2012 Rio de Janeiro’s Governor Sergio Cabral said in a press conference that it was necessary to overthrow the old museum. The building was abandoned in 1977 and occupied by indigenous communities since that moment. “It has no historic value and it is going to be demolished because the FIFA and World Cup Organizational Committee demand it” he explained. However, the FIFA clarified through a press note in posterior dates that it never asked for the demolition of the Indian Museum. In the Guarani-Kaiowá and other ethnicities response to that decision was clear. The twelve of January 2012 a police unit arrived at the indigenous land without a judicial order to evict the community and the inhabitants were waiting to them at the beginning of the settlement to defend it. The settlement siege lasted over 12 hours and finished when the police unit left the territory without taking any action, as they never had the embargo and demolition judicial order. The retirement was applauded by the indigenous community. Despite of this temporary victory, the Guarani-Kaiowá tribe is still threatened by more mobilizations that would try to evict them from the unique place they and their ancestral culture are protected. BirdWatchers, a 2008 film drama by Marco Bechis. ^ a b c d e f "Kaiwá." Ethnologue. Retrieved 6 Jan 2013. ^ Sue Branford (28 January 2003). "Obituary: Chief Marcos Verón". The Guardian. Retrieved 19 March 2012. ^ a b Oliveira, João Neves de (23 October 2012). "Grupo de 170 índios ameaça cometer 'suicídio coletivo' em aldeia no MS" (in Portuguese). Campo Grande: O Estado de S. Paulo. Retrieved 24 October 2012. ^ "Nota sobre o suposto suicídio coletivo dos Kaiowá de Pyelito Kue". CIMI (in Portuguese). 23 October 2012. Retrieved 24 October 2012. ^ Rocha, Leonel (17 October 2012). "Índios Guarani-Kaiowá anunciam suicídio coletivo no MS". Época (in Portuguese). Retrieved 24 October 2012. ^ "Decisão judicial mantém índios guaranis-kaiowás em fazenda no MS". Fatima News (in Portuguese). 2012-10-30. Retrieved 2012-10-31. "Guaraní Indians", by James Schofield Saeger, in Encyclopedia of Latin American History and Culture, Barbara A. Tenenbaum, ed., vol. 3, pp. 112–113. (The article contains numerous additional references). This page was last edited on 15 December 2018, at 11:13 (UTC).